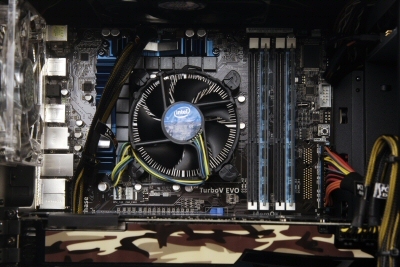 An Intel Core i5 750-based machine for gaming and much more! 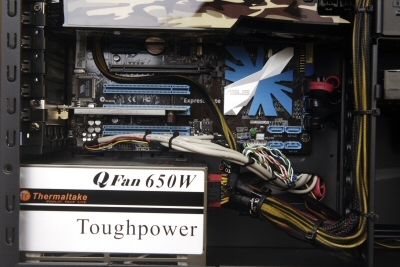 The CPL Core i5 750 desktop PC is well built, fast and looks reasonably menacing. It can be used for gaming as well as office work and video editing and it has plenty of room for expansion. For $1710, we think it's a pretty good buy. CPL (Computer & Parts Land) has produced an Intel Core i5-based system that's far from ordinary. It looks badass thanks to the Cooler Master Storm Scout case, and its performance is impressive. It offers a glut of features for a competitive price of $1710. The CPL Core i5 750 looks menacing from the outside and it is easy to carry if you want to take it over to a mate's place for some LAN gaming. You can pick it up by its handles to transport it, but it's still easier to cradle it in your arms as you walk. The case's windowed side-panel shows off the soul of the PC: an Intel Core i5 750 CPU that runs at 2.66GHz but speeds up to 3.2GHz when the PC is under a full processing load. Around the CPU are 4GB of DDR3 SDRAM, a 1TB Western Digital hard drive, and, most importantly, an ASUS GeForce GTX260 graphics card with 896MB RAM. It's a potent configuration that will be suitable for just about any sort of work, and the best part is that it can be used for gaming. It's not a high-end gaming machine by any means, but the GeForce GTX260 graphics card will let you play many of the latest games smoothly at a resolution of 1280x720. This was shown in its 3DMark06 result of 12,312. Many DirectX 10–based games, such as Crysis, will run close to 40 frames per second — which is enough to maintain smooth gameplay even when the action gets hectic. The engine room has an Intel Core i5 750 CPU, 4GB of DDR3 RAM as well as a GeForce GTX260 graphics card. For everyday applications such as Web surfing, word processing and spreadsheets, the CPL is overkill, but it's ideal for media encoding and video editing. The CPL Core i5 750 recorded a time of 54sec in the iTunes MP3 encoding test (in which we convert 53min worth of WAV files to 192Kbps MP3s) and 36sec in the Blender test (in which a 3D scene is rendered using all available CPU cores). Its MP3 encoding score is actually better than the Alienware Aurora ALX, and the Blender score is only 7sec off despite using half the number of threads (the Alienware can process up to eight threads at once, while the CPL can only do four). In WorldBench 6, the CPL scored 126, which is only one point shy of the Alienware Aurora ALX. This isn't surprising: the Core i7 920 CPU in the Alienware runs at 2.67GHz, and most everyday applications don't make use of multiple CPU cores. While the CPL Core i5 750's basic configuration is strong, we love the fact that it comes with extras such as a Blu-ray reader/DVD burner combo drive (Pioneer BDC-S02), wireless networking and a large array of ports. The large number of ports is thanks to the ASUS P7P55D Premium motherboard, which has 12 USB 2.0 ports, two eSATA ports, one FireWire port, as well as Gigabit Ethernet and digital audio output. You even get two PS/2 ports. There are four memory slots, two PCI Express x16 slots (when both slots are in use, such as in an SLI configuration, they each run at x8 speed), two PCI Express x1 slots and two PCI slots. CPL has only installed a graphics card and a D-Link DWA-510 wireless adapter, so there is plenty of space for upgrading. The Cooler Master Storm Scout is a mid-tower ATX case with five internal hard drive bays as well as five optical drive-sized bays, and it's well designed. The hard drive bays face outward and let you easily add and replace hard drives. The bays are tool-less; rails and locks are used to keep them in position. CPL has only included one 1TB drive in this system, so there is plenty of room for expanding. 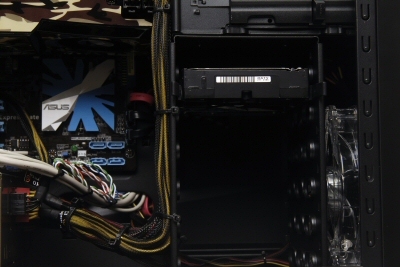 Fans at the front of the case keep the drives cool, while fans at the rear and top of the case extract warm air. The drive bays face outward and are easy to access. Drives reside on rails and locks are used to keep them in place. There are plenty of ports located at the top of the case toward the front: four USB 2.0 ports and an eSATA port. The ports are easy to access if the case is on the floor. All up, it's a very well featured and solidly built case for a system in this price range. CPL has made the system as neat as possible by tying cables in neat bundles and running them up the sides of the drive bays. The fast performance, vast room for expansion, extra features and solid chassis make the CPL Core i5 750 a very good buy. If you're in the market for a new-generation PC with plenty of features, and you don't want to spend more than $2000, then definitely consider this system. It's suitable for office work, image and video editing, and well as gaming.